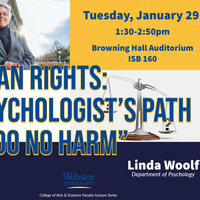 "Human Rights: A Psychologist’s Path to 'Do No Harm'"
Presented by Linda Woolf in the Department of Psychology. Too frequently throughout the history of the psychological science, psychologists have used their knowledge to promote harm – often under the guise of the greater good. How can a profession grounded in the ethical principle of "Do No Harm" engage is torture, apartheid, and the promotion of other destructive policies? Together we will look at how ethical principles grounded in human rights and social justice can protect against future ethical lapses and harms.